Ballota nigra has a very strong characteristic smell that reminds of mould or humidity, and can be recognised by its clusters of hairy, reddish-purple flowers. It can grow up to 3 feet in height. It has herbaceous ascending stems, wooden and branched at bottom, covered by down folded hairs. The plant has a taproot system. Leaves are opposite and decussate, and range from oval-lanceolate to heart-shaped, with crenate or dentate border. Leaves, dark green and usually pubescent, measure 3–8 cm per 2–6 cm, and have 1–3 cm petiole. Upper face is wrinkled, with a net-like vein pattern. Flowers are organized in verticillasters, subspherical to about one-sided, with 15 to 30 flowers. Each verticillaster consist of two condensed dichasial cymes at axils of normal leaves. Flower has an actinomorphic calyx (length 9–10 mm, width 7 mm), made up by five sepals fused together in a tube with five teeths; and a labiate corolla of 12–13 mm, ranging from pink to pale purple to withish. The corolla consist of a tube of about 6 mm and two lips; the upper one slightly concave (like a hood) and externally hairy; the lower one glabrous, with two minor lateral lobes and a major central bifid lobe. There are four didynamous stamens, running parallel under the upper lip, with glabrous filaments and yellow anthers. Ovary is superior, with a single white style and a 2-parted stigma. Below the calyx there are five filiform bracts, 8 mm long. Each fertilized flower produces a tetrad of black nutlets, cylindrical to ovoid, 2 mm long, partially or fully covered by the calyx. The basal end is flat and attached to the receptacle, while the top end is rounded or pointed. Ballota nigra contains diterpenoids like marrubiin, ballonigrin, ballotinone, ballotenol and 7-acetoxymarrubiin. Also, it contains phenylpropanoids that have shown to be antioxidants. The plant was described by Linnaeus in Species Plantarum (May 1753). The name Ballota comes from the Greek ballo (to reject), because of the strong offensive odor of the plant; cattle will not eat it. The specific name nigra could refer to the black colour of dried leaves. The common name comes from the Old English words har, meaning "downy or hoary", and hune, meaning the plant itself. This name refers to the hairs that give the herb its distinctive appearance. 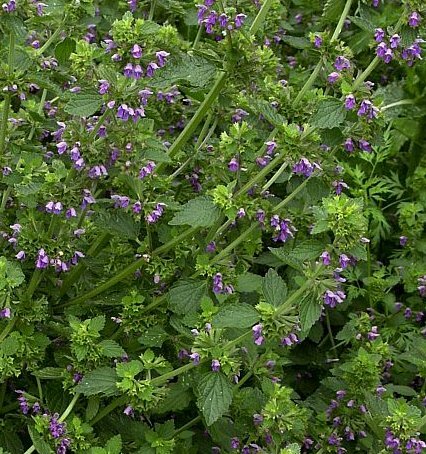 In modern times, alternative medicine practitioners have referred to the plant as "seed of Horus" and suggested that horehound takes its name from Horus, the Egyptian sun god. Ballota nigra is a nitrophilous plant; it grows in ruins, fallows and hedges, up to 1300 m. It prefers loose, calcareous (alkaline) soils. It tolerates temperatures as low as -5°/-10 °C. Usually, the plant is used dry, harvested when blooming. Syrups can be made from fresh plants.